← Jack the Ripper finally IDENTIFIED!!! I have just returned from a holiday in Miami and suitably refreshed I am now going to present my promised blog about how to get your book / novel / novella high in Google’s search rankings…. The absolute holy grail for any web page designer is to carefully construct a web page so that it appears on page 1 on any chosen search criteria on google. In simple terms this means that if someone types in your book title in Google they will find it quickly and easily as the hyperlink to your page or blog will be on page 1. Better still is to be in the top section of page 1. Best of all is to have No 1 ranking! Is it possible for writers to achieve this? Yes it is and I have recently achieved it! Please check out the graphic below showing a screen print of Google showing my book at position 1….. 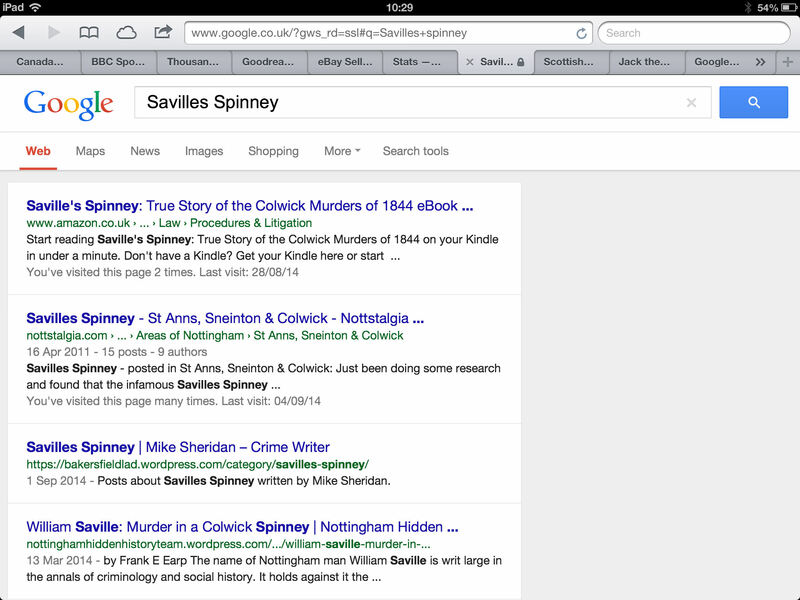 In fact on the day in question when I captured this screen image, I held the top 3 rankings on my chosen search criteria ie book title of “Savilles Spinney”. First is a link to my ebook on Amazon, second is a link to a local Nottingham Forum where I placed information about my book and third is a link back to my WordPress blog where I have been blogging about my book for some time. Is this just good luck, have I been really lucky or is there is a process at work here? Can anyone get there book high in google rankings? Well yes I believe they can. My journey into publishing my first e-book on July 2014 actually began back in April 2011 when I stumbled on this amazing story via an internet search. 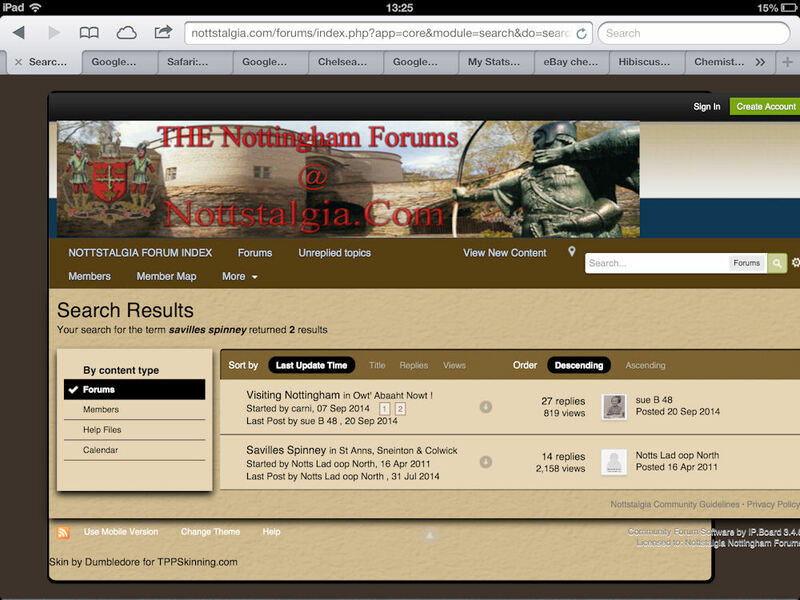 I was already a member of a Nottingham discussion forum so I began a new thread titled “Savilles Spinney” and requested help from locals – and they were very helpful and helped me with the story. Recently I returned to announce the publication of my book, and I included not just news but a hyperlink back to my book for sale on Amazon. In other words I put a pointer or navigation link back to my book. Here is a screen print of the Forum.. I have also put a link back to my book on Goodreads ( www.goodreads,com) and am pleased to see at least 7 people have chosen my book on their lists “to read” and one is apparently reading it now. You cannot have enough of these links back to your book, there is a definite correlation between these links and high search engine rankings. Now let me return to my blog on WordPress. For my first book I wanted readers to be able to follow my journey from idea through to fully published book. I even uploaded draft chapters to read for free and using categories and tags noted with some satisfaction that my blog was usually very high in google rankings according to chosen criteria. Well it all seems to have worked and I have little doubt that my planning and scheming has worked. Of course I have to say that that search engine rankings are dynamic and your book can rise and fall in google rankings as it can indeed in the Amazon sales charts. That said if you don’t or have not been using the categories or tags in WordPress. Have not been putting metadata in the head of your home page, and have not been putting hyperlinks to your book on Amazon…….dont worry! You can go back anytime and do all that…… and watch your book rise in the google rankings! 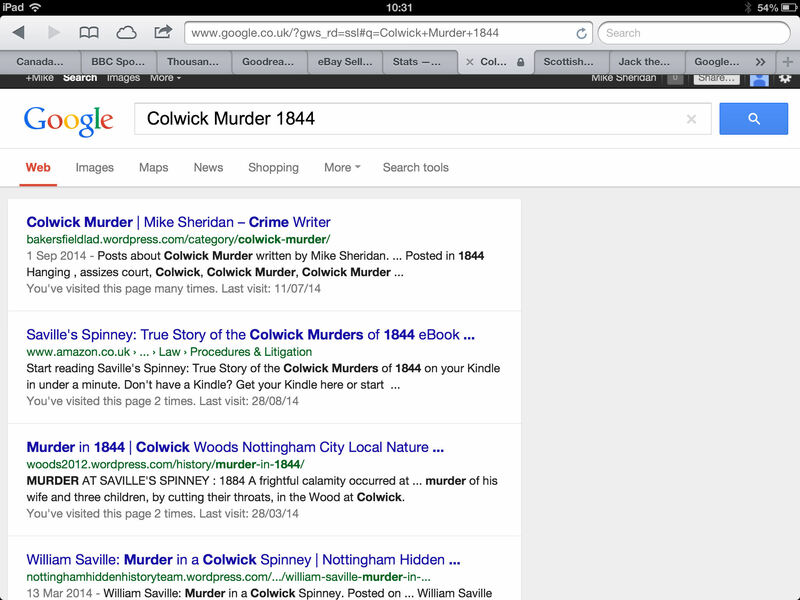 So readers, if you want high search engine rankings off you go…. Bang your drum, blow your trumpet, tell all and sundry about your work and don’t be bashful. Use all of your networks. You cannot know too many people and leave no stone unturned in your quest. You can try the local papers, radio stations, offer up a short condensed version of your story free of charge. Go on, shout it from the roof-tops, its your book and you want to see it succeed as do we all! Good luck and never ever stop working on it! These are the thoughts and witterings of Indie Author Mike Sheridan currently working on his second book. Please feel free to share or re-blog this post to help other fellow creative spirits. 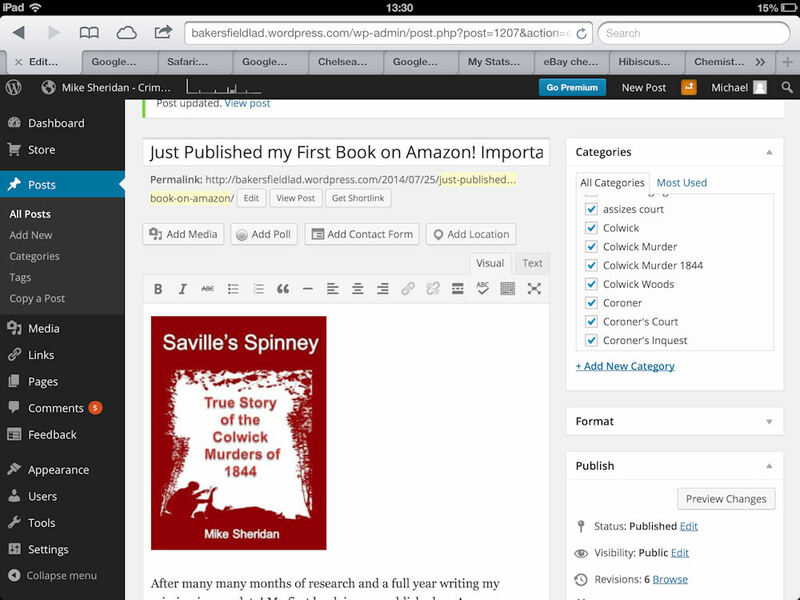 This entry was posted in 1844 Hanging, Becoming and Indie Author, Book Cover Design, Colwick Murder 1844, crime writer, Crime Writing, Designing a book cover, e-book, First book, First book published, Get on page 1 of Google, Google, High Search Engine Ranking, Historical crime, Ideas for writer, Indie Author, Murder in Saville's Spinney, Nottingham Murder 1844, Saville's Spinney, Savilles Spinney, Search Engine Friendly, Selling on Amazon, selling online, Tools for Writers, True Nottingham Crime, Writer, Writing, Writing formula, writing ideas, writing process and tagged capital punishment, crime, crime novel, crime research, crime writer, crime writing, first book, getting published, Google, How to get published, murder mystery, Murder story, No 1 ranking on Google, writer, Writing. Bookmark the permalink.